While I was tumbling down the pinterest hole, I saw someone had pinned my brown butter pancakes. 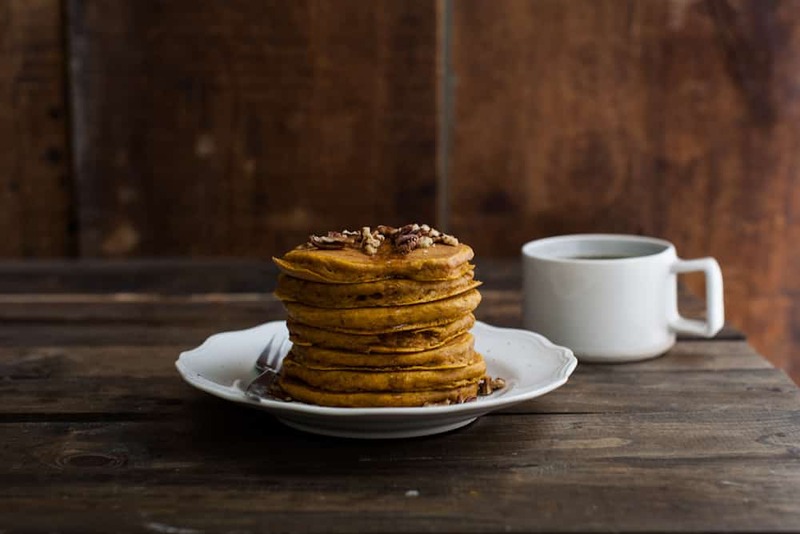 I took a second, only one second, and thought to myself: “I need to make these again, but with pumpkin!” You really can’t go wrong with the flavor of brown butter and pecans, but add pumpkin and it’s such a wonderful fall treat. I tend to leave the batter fairly thick to create hefty pancake but if thin pancakes are your thing, just add a few extra tablespoons of milk. If you don’t want to buy a vanilla bean, add a touch of vanilla extract. 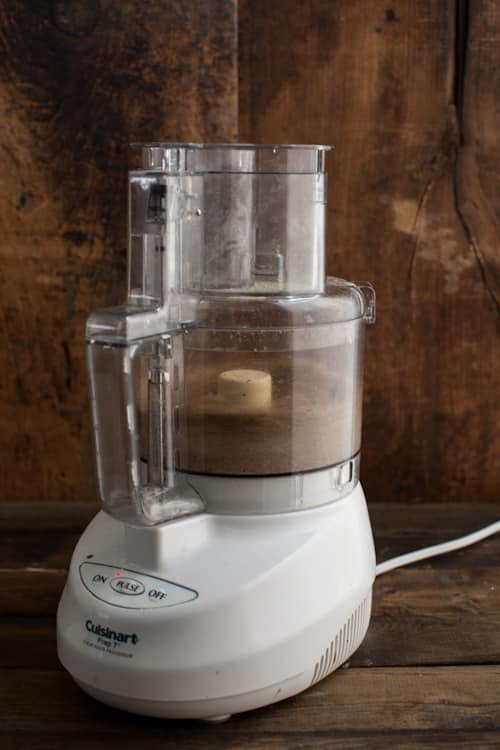 Butter: If you didn’t want to take the time to make the brown butter, you could just use regular melted butter. 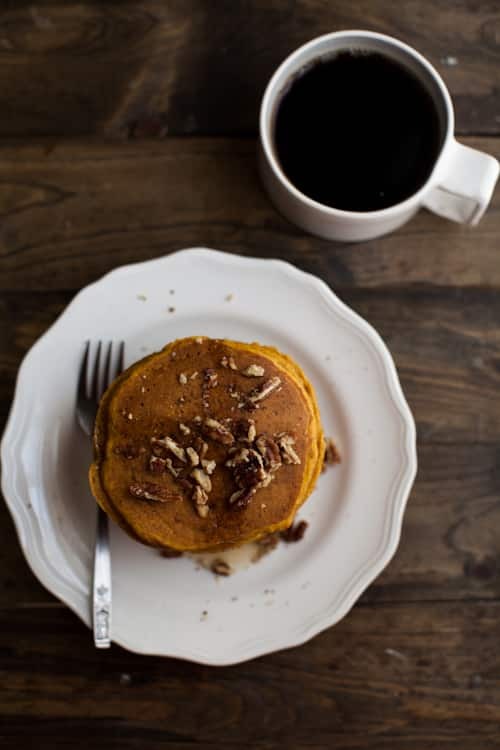 The flavor won’t be the same but you will still have some lovely pumpkin pancakes. 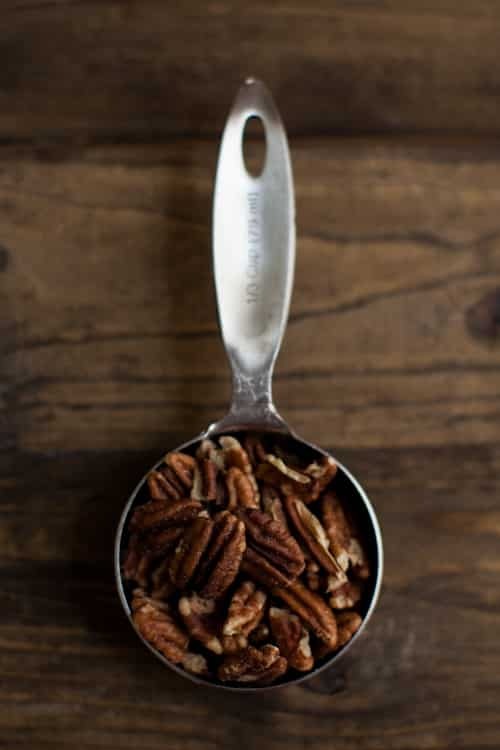 Mix up the nuts: There’s rarely an occasion I don’t have pecans in the house but if on the off chance I don’t, I’ll use walnuts instead. 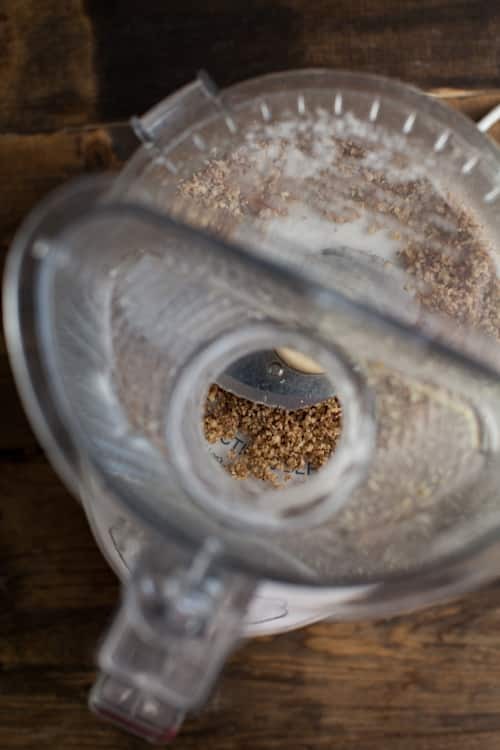 I recommend keeping the nuts, it adds a nice bit of texture to pancakes (which may seem odd, but this is coming from the girl who will occasionally add granola to pancakes). 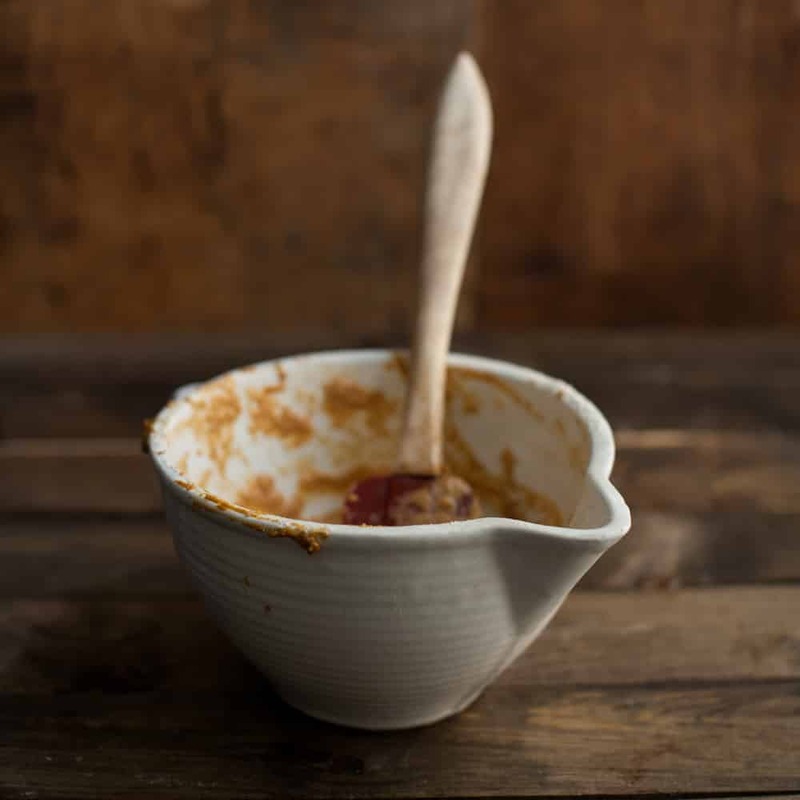 Use up the leftover puree: Make this soup, some pumpkin latte syrup (I’m obsessed), porridge, or my favorite pumpkin oat bread. Combine wet mixture in to dry mixture and stir until batter is combined. Stir in more milk if consistency is too thick, you want the pancake batter to easily pour onto the skillet (but not be too thin). Heat a skillet over medium heat. When skillet is hot (if you flick water onto the skillet, it should sizzle), take about ¼ cup of batter (I use an ice cream scoop) and pour onto skillet. Let cook for 1-2 minutes (until the pancakes begins to bubble slightly. Flip and let cook for another 1-2 minutes until pancake is cooked through. The thick fluffy pancakes are much more my thing. Love these! YUM. I’d love to make some kind of honey pecan butter to drizzle on top of these. Lovely! I could use a stack of these to start the day off on the right foot. 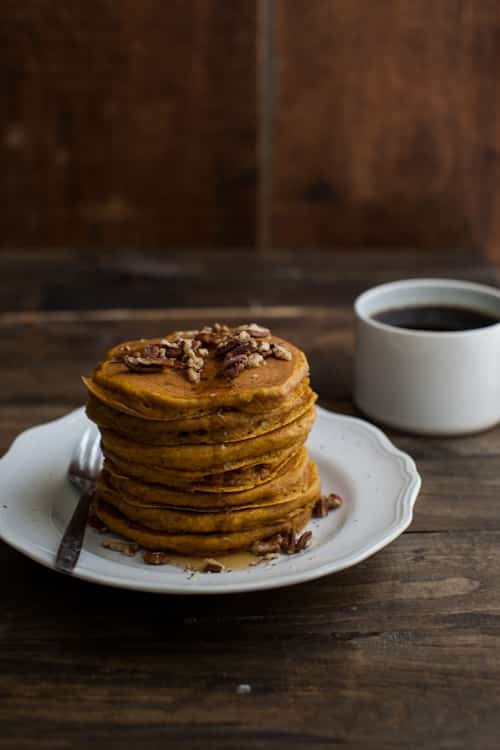 Pumpkin pancakes are some of my favorites, love how you photographed them. Beauties! Oh boy!! I have your brown butter pancakes saved and am definitely saving these too!! Beautiful photos and a great flavor combination. These are definitely on my brunch list! 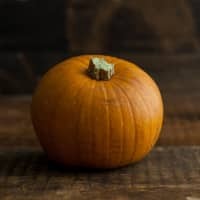 I am so pumpkin-obsessed this time of year. Love these. I made squash pancakes last weekend. They weren’t quite as vibrant orange. Will definitely have to try these! 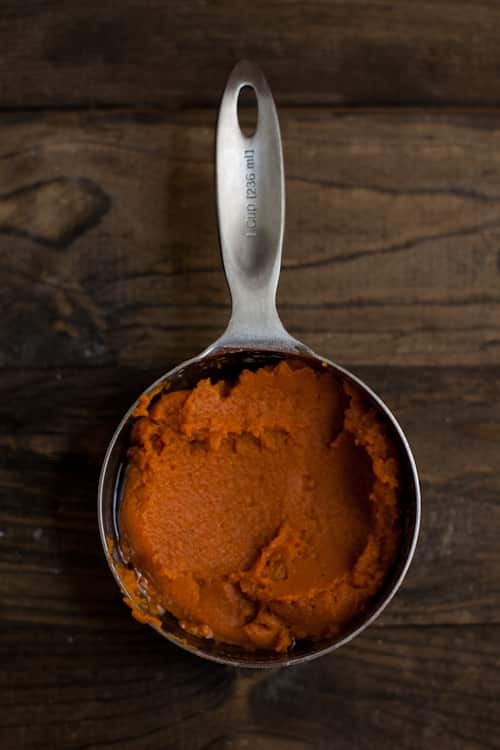 I cheated a bit and used canned organic pumpkin from Whole Foods- the color of the pumpkin puree was unreal! Estos panqueques son una obra maestra! Masterpeace!!! Not to be rude or anything, but does anyone who comments on these recipes actually try them out? It always seems to be people praising how the recipe looks instead of how it actually tastes or works out. For instance, I am about to try this recipe and nutmeg is listed as an ingredient but no measurement is given. Thanks for posting this but it just seems to be a lot of armchair cooks hanging around the internet. Made these today and they were fantastic! Another great recipe, thanks Erin! It’s truly Fall! 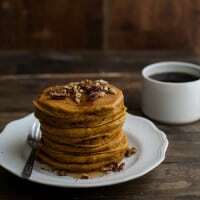 Pumpkin pancakes sound amazing. I can’t wait to give these a try! I can’t wait to try these. Your photos are wonderful! These sound delicious. I love all the flavours in here, I will surely make them on day, soon. I love your posts. This one is doing the same thing with two measurements. Instead of giving whatever it is, there is a little square. It is for the pecans and whole wheat pastry flour. I have windows 10 on an 8 operating system. These look amazing. I’ll be making these for my family this weekend. Yum, Sunday morning treats for the fam! Beautiful looking pancakes – light and fluffy!! Another great recipe! Can’t wait to make them!! Thats perfect to include in a healthy diet. So great that I found this recipe just before the weekend. Looks so good. Can’t wait to try this! !